Reach the children. Serve the youth. Mentor through ministries. Those are among the recommendations compiled recently by SIM’s country review of its work in Angola. “Angola has been isolated for a long time, partly due to colonial policies in the old days, then due to the civil war and a Marxist regime. And, of course, Portuguese as its official language has also served to create a language barrier as well,” said SIM Angola Country Director Sheila Fabiano, who has lived there since 1979. SIM Angola consists of about 25 adults who are Dutch, German, Swiss, American, Canadian, and Brazilian. Ministries include urban medical centres, theological education, translation, agricultural ministries, and a rural flying doctor programme. 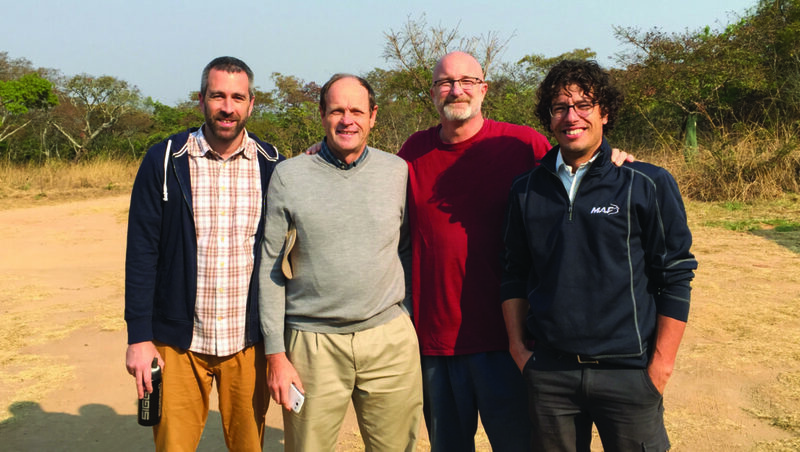 SIM missionaries Marcus Baeder (plaid shirt, serving in Cape Town) and Dave Bremner (grey sweater, serving in USA) are shown with a colleague and their MAF pilot in Angola. The review team included Dave Bremner, a South African serving as an SIM International Deputy Director, and two SIM International missionaries serving in South Africa – Southern Africa Zonal Coordinator Marcus Baeder and Champion for Student Ministries Emma Brewster. Split into four pairs, the team visited about twenty sites and conducted over 200 interviews in only two weeks. Planning, logistics, and transportation were big challenges for such a large country, but pilots and airplanes from Mission Aviation Fellowship (MAF) helped tremendously. One pilot even helped translate for one of the interview teams. “We would not have been able to do that without them, that’s for sure. The distances are just too vast — I mean, the country’s bigger than South Africa, surface-area-wise — and the road systems are not in very good shape …. We did some driving, but for all the major distances, we had to fly,” Marcus said. Sheila and Marcus both said that the review process went well, adding that everyone was glad to be consulted and asked for their observations and stories. Reviewers spoke to SIM staff and partners, including leaders of SIM’s partner church, Union of Evangelical Churches of Angola (UIEA, also known as União). “I think this reflects the fact that the country review team did a good job of presenting their enquiries in a way that elicited participation and not suspicion,” Sheila said. One of the recommendations was to develop child and youth ministries. Sheila said that 68 percent of Angola’s population is under 25 years old, but most evangelical churches offer them few programmes other than singing in the choir. The UIEA has been asking for missionaries to help in developing such programmes, she said, but no candidates have sought those assignments. Other recommendations included strengthening the leadership team, defining their mission and vision more clearly, and examining whether it would be beneficial and worthwhile to register SIM Angola as a separate, legal entity instead of continuing under the aegis of the UIEA. During the Marxist era, groups like SIM were not permitted to register on their own. Sheila said the UIEA leaders are godly and wonderful and that SIM and UIEA continue to have a close, amicable relationship. The team gave a summary presentation before leaving Angola and is preparing its complete report, which Marcus is compiling. He expects the fifteen to twenty page report to be finished soon. Once the report is finalized and translated, Sheila will present it to SIM Angola’s board members and the executive of the UIEA. They will then determine which points to address first and how to do so. Sheila said she would have appreciated suggestions of how to implement the recommendations or examples of how other countries addressed similar challenges. “It will take us a while to work through all the recommendations and to figure out what to do and how,” Sheila said. for continued good partnerships between SIM Angola and national churches, particularly the UIEA, so that they can work together to meet the challenges and opportunities for ministry in extending God’s kingdom, as well as in strengthening believers. for wisdom and discernment in determining priorities and strategies for ministry. for God to call more personnel to join the work in Angola, especially those with a heart and calling to work with youth, and in all areas of capacity building.